It might have been the prawn risotto that made the weekend so special. 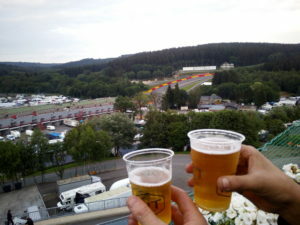 Of course, it could have been the majestic Spa circuit but, then again, perhaps it was the silverware we took home. 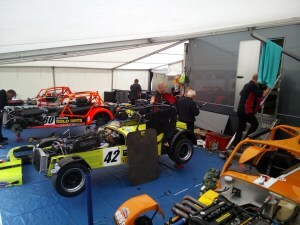 In fact, Boss Racing’s clients had a pretty good weekend in Belgium with a win and two second places. None of that, of course, was achieved just by sitting in the sun enjoying the results of Tim Davis’ culinary skills. We had plenty of work to do, as usual. Jonathan Pittard’s newly-built supercharged Caterham CSR suffered persistent teething troubles while Colin Watson’s efforts in our number 92 car turned into an economy run, especially in the second of the two races which mixed Gold Arts Magnificent 7s runners with all-comers. Our annual pilgrimage to the Belgian shrine of speed began on the Wednesday before the meeting. We took five race cars plus the number 93 usually driven by Hugh Coulter to act as a stand-by. They were loaded into four vehicles and three of them, crewed by Tim Davis, Colin Watson and Kevin King, set off at 0500hr, arriving at 1500hr to prepare our paddock space. Gary May, Jack Hannah and me had workshop commitments so we didn’t arrive at the circuit until 0100hr the following day. While Britain sweltered in the heat, Spa enjoyed cooler temperatures which suited us just fine and made working on the cars much more comfortable. In fact, there was some rain on Thursday morning which interrupted but the sun came out in the afternoon and so did the cars. Among them was Jonny Pittard but in the day’s final session he suffered a shredded supercharger drive belt. As we were to discover, this was to be a constant feature of the week-end. It sent us on a desperate dash around the local garages for a replacement belt. We managed to find one that was suitable and arranged for others to be sent out to us, just in case. It turned out to be a wise precaution. In qualifying Christian Pittard was blisteringly quick. On the lap which won him pole position, a 2min 34.8, he averaged 162.8 kph (101.75 mph). A cooling down lap and the car was parked in the pit lane – job done. Tim (C400) qualified third with Richard Carter (CR300) fourth, Colin (C400) seventh and Jonny eighth. Peter French (Superlight) was 44th. 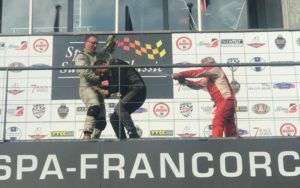 Jonny achieved his time on his fourth lap after which his supercharger belt let go again. We tried everything we could think of to stop it happening again including adjusting pulley alignment and trying different belts of different lengths but to no avail. His brother, meanwhile, was preparing to turn his magnificent pole lap into a win in the first race. Christian’s plan was to take it relatively easy in the initial stages to conserve his tyres. He was fifth on the first lap while Tim forged ahead, going to the front on laps two and four as he and Peter Ratcliff disputed the lead. Christian closed in and led the field for five of the last six laps. At the flag he was 1.3 sec ahead of Tim, with Ratcliff demoted to fourth by a track limits penalty. Colin, meanwhile, had a steady race in the top six until he ran out of fuel on lap 13. It was no surprise because we knew he’d be marginal with his car’s small tank. Richard was running fifth but spark plug failure forced his retirement two laps from the end. Jonny failed to complete one lap but Peter French finished 37th. Christian was so confident after his win that he decided to use different rubber in the second race. We took a couple of sets of tyres with us that had been shaved to 2mm, the idea being that they wouldn’t overheat during a hot 40 minute race. Testing on the Thursday however showed that they didn’t ‘switch on’ and struggled for grip but with a win in the bag it was decided to give them a go. They did indeed lack grip, a few more degrees hotter may have been a different story, but he still finihsed only 2 seconds down on winner Ratcliff. Tim also encountered trouble. In the first race his oil warning light had been flashing so we topped his tank up to the top. The result was that during the second race oil was being blown out over his legs. Sensibly, he decided to stop on the sixth lap. Jonny decided to take it easy during the early going and keep below 80 per throttle to ease the load on his supercharger belt but when he started to push the trouble returned and he was out on the ninth lap. Richard had a magnificent start so that by the fourth lap he’d caught Tim. But he lost touch with the leaders through the pit stop sequence and ultimately finished fourth – nearly 50 secs behind the winner. Colin also took it easy to eke out his fuel but he ran out just the same, although this time it didn’t happen until the last lap. He actually crossed the line in the pits to finish eighth. Overall it was a successful weekend for Team Boss and a very enjoyable one, enhanced, of course by Tim’s tasty treats.